Bath time is special in our house and has become somewhat meaningful. Not only is water so calming, fun, and it's a time to connect with Addie, BUT because our daughter has a lot of medical issues, it has become even more coveted. Let me explain a little bit about why, and then I will share all over our favorite bath toys, bubbles, washes, and oils. We do love our bath time. I remember the first time I was able to bathe her, at nearly 3 months old. It seems like a staple to most parents, and although I am sure it was special, it is even more meaningful for a parent of a preemie who had to wait for months to just do this simple task of cleansing their baby. Before then, it was simple sponge baths, done infrequently, so that we did not over stimulate her, mess with the temperature of her body, etc. Adeline had malrotation & volvulus, and before it was discovered it was really hard for her to poop. On top of medications, laxatives, formula changes, our doctor prescribed two baths a day. For a kiddo who was throwing up 12-15 times a day and was very constipated, she was uncomfortable a lot of the time. During bath time, she would relax, and we would disconnect her from her feeding tube and just chill. Many times we would get a bath together and they are some of the happiest memories I have of her very difficult infancy. In November 2016, Addie had a broviac catheter places (pictured near her heart), in order to receive her nutrition via IV. This means she can barely ever bathe. Some kids with central line never take a bath, but we choose to do them weekly, with precautions taken. This makes bath day a special day in our house, she runs screaming with joy towards the tub and we can't wait until she actually feels clean. Bambo Nature is one of our favorite products and we especially love their bath oil, body and hair wash. We love the Splash Bath Oil which we use to keep her very sensitive skin moisturized. We like that it's mild, and contains high quality natural and organic certified ingredients and is free of perfumes, parabens and dyes. Bath Buddy (hair & body wash) is also great as it was designed for kids with sensitive skin, it's allergen-tested, vegan, organic and contains no perfumes, parabens or dyes thus minimizing the risk of allergic reactions and is gentle on the eyes! Many kids with Short Bowel Syndrome get extremely painful rashes so it's also important the products we use in the tub are gentle and do not increase her pain. Many of these toys she has had forever, and the newest additions are the bath crayons and foam letters. Some great developmental bath tub play should include scooping, dumping, pouring. It's the only time Mama's won't mind their toddler dumping the contents of something. Pouring and dumping is discovery and exploration of gravity, weight, muscle control, cause and effect, and self-awareness. Not only are toddlers discover what they can do by pouring , they are learning about their environment while working on so many skills. We love the boon pipes for this, the Finding Dory Net, and even simple cups found in your own cabinets. 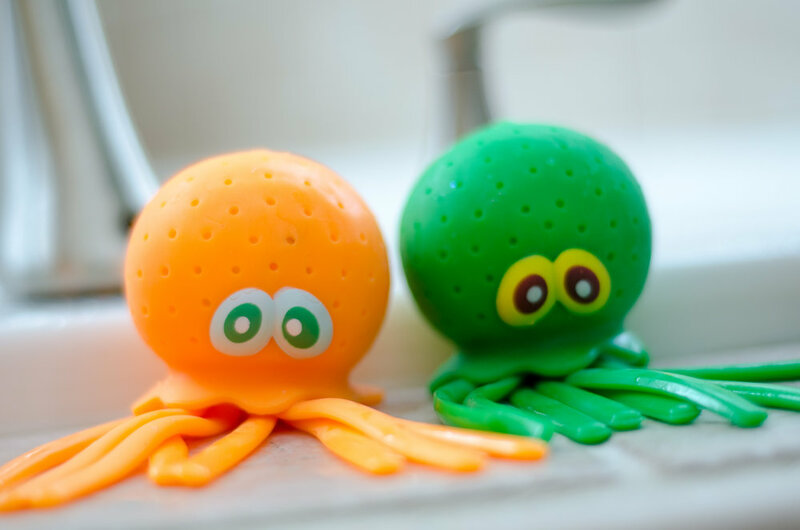 Toys that improve their fine motor skills and hand eye coordination through actions like pouring, squirting, scrubbing, stirring and squeezing and we love our rubber ducks, toys that come with Eric Carle bath book, and our Octopus Splash Bomb. Water play has so many benefits, so allow your kids to take their time in the tub. Water play can improve fine motor skills as mentioned above, problem solving skills by exploring a substance, making discoveries, and learning more about cause and effect, it's a great opportunity to increase language, can provide sensory benefits and can be calming, and can even be the beginning of learning math concepts such as; empty/full, and science concepts such as gravity and sink/float. To shop, scroll on down and click on any of the photos and it will take you directly to where you can get the same toys. Scrub a dub dub! 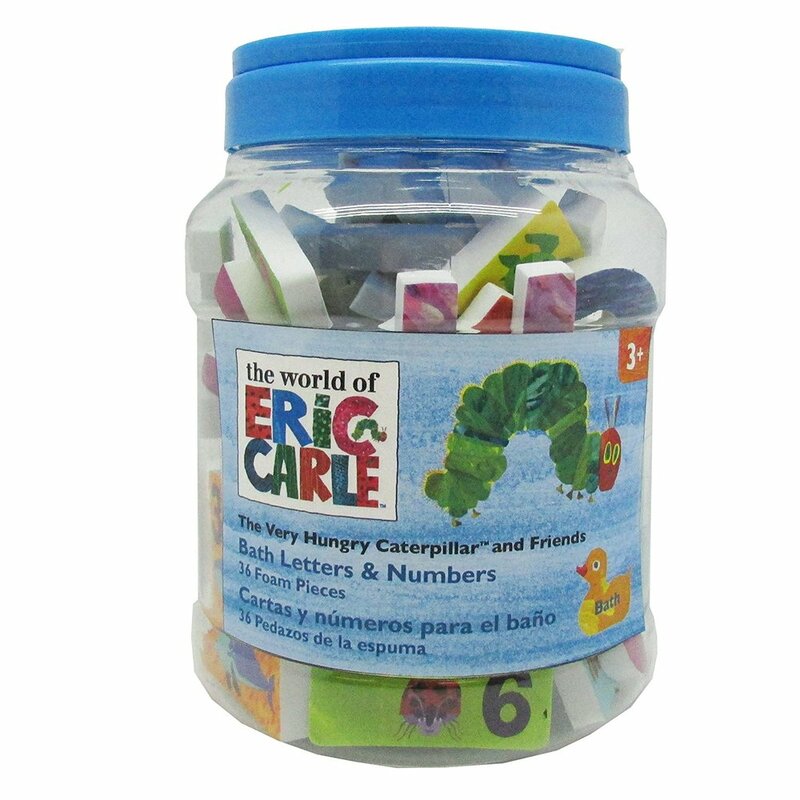 You may also be interested in Sensory Processing 101, Fine Motor 101, or 25 Toys to Get Your Toddler Talking.